A storage topic today. If you're new to this blog, here is another article which shall help to study towards a Professional vSphere 6.7 Exam 2019. It's not an official study guide, but rather a community-driven study guide which is taking shape at this page – VCP6.7-DCV Study Guide – VCP-DCV 2019 Certification. The topic today is called “Describe storage types for vSphere”. A very large topic indeed. We'll try to stick to it. However, we don't really have any sub-chapter guidance on what exactly VMware wants us to cover. Follow the documentation, use your experience, study elsewhere. We're not the only blog around. Also, the VCP6.5-DCV study guide is a good help as the objectives covered were guided by sub-chapters and as such the topics might be targetted more accurate. This does not mean that the guide we're working on is not good… -:). We're simply saying that nothing better than studying from multiple sources (documentations, study guides, blogs). In order to become VCP-DCV 2019 certified, you can still pass the VCP6.5-DCV exam and earn the VCP-DCV 2019 badge. And, there is fewer chapters. Did you know? Local and Networked storage – while local storage is pretty obvious (direct attached disks or DAS), the networked storage can be different types, but most importantly, can be shared and accessed by multiple hosts simultaneously. VMware supports virtualized shared storage, such as vSAN. 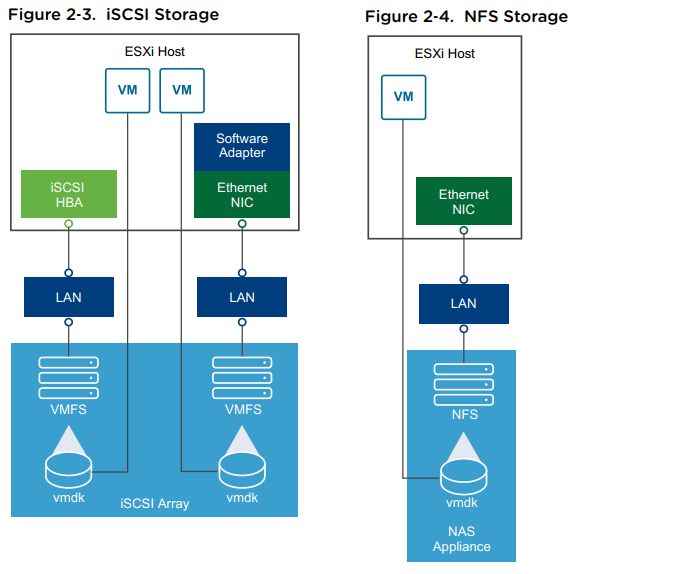 vSAN transforms internal storage resources of your ESXi hosts into shared storage. Fibre Channel (FC) storage – FC SAN is a specialized high-speed network that connects your hosts to high-performance storage devices. The network uses Fibre Channel protocol to transport SCSI traffic from virtual machines to the FC SAN devices. The host should have Fibre Channel host bus adapters (HBAs). Internet SCSI (iSCSI) storage – Stores virtual machine files on remote iSCSI storage devices. iSCSI packages SCSI storage traffic into the TCP/IP protocol, so that it can travel through standard TCP/IP networks instead of the specialized FC network. With an iSCSI connection, your host serves as the initiator that communicates with a target, located in remote iSCSI storage systems. Hardware iSCSI – Your host connects to storage through a third-party adapter capable of offloading the iSCSI and network processing. Hardware adapters can be dependent and independent. Shared Serial Attached SCSI (SAS) – Stores virtual machines on direct-attached SAS storage systems that offer shared access to multiple hosts. This type of access permits multiple hosts to access the same VMFS datastore on a LUN. VVol: introduced in vSphere 6.0 and is a new paradigm to access SAN and NAS storage in a common way and by better integrating and consuming storage array capabilities. With Virtual Volumes, an individual virtual machine, not the datastore, becomes a unit of storage management. And storage hardware gains complete control over virtual disk content, layout, and management. vSAN datastore: If you are using vSAN solution, all your local storage devices could be polled together in a single shared vSAN datastore. vSAN is a distributed layer of software that runs natively as a part of the hypervisor. Raw device Mapping – RDM is useful when a guest OS inside a VM requires direct access to a storage device. VAAI – vSphere API for Array Integration – those APIs include several components. There are Hardware Acceleration APIs which help arrays to integrate with vsphere for offloading certain storage operations to an array. This reduces CPU overhead on a host. vSphere API for Multipathing – This is known as Pluggable Storage Architecture (PSA), uses APIs which allows storage partners to create and deliver multipathing and load-balancing plugins which are optimized for each array. Plugins talk to storage arrays and chose the best path selection strategy to increase IO performance and reliability.